No quilt is complete without binding. Learn how to add binding in several ways with Ashley Hough and Toby Lischko in this exclusive GOLD LIVE class. 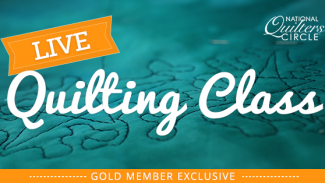 Receive tips on how to attach a traditional binding using both machine and hand stitching, see how to bind a curved edge, learn how to make a flange binding and see how to fold the backing around the edge of a quilt to create a binding.